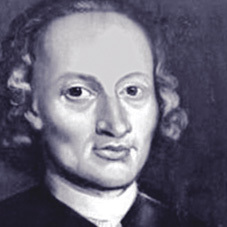 Johann Pachelbel (1653 - 1706) was a German composer known for his works for organ and one of the great organ masters of the generation before Johann Sebastian Bach. Pachelbel studied music at Altdorf and Regensburg and held posts as organist in Vienna, Stuttgart, and other cities. In 1695 he was appointed organist at the St. Sebalduskirche in Nürnberg, where he remained until his death. He also taught organ, and one of his pupils was Johann Christoph Bach, who in turn gave his younger brother Johann Sebastian Bach his first formal keyboard lessons. All Pachelbel’s work is in a contrapuntally simple style. His organ compositions show a knowledge of Italian forms derived from Girolamo Frescobaldi through Johann Jakob Froberger. Of special importance are his chorale preludes, which did much to establish the chorale melodies of Protestant northern Germany in the more lyrical musical atmosphere of the Catholic south. Pachelbel’s Canon was written for three violins and continuo and was followed by a gigue in the same key.